After a loved one dies, you may be focused on grieving their loss and comforting other members of your family. However, if you have been named as the Executor in your family member’s Will, there are a number of administrative and legal matters which will need to be resolved so that the estate can be closed and property can be distributed among that person’s heirs. Below, you’ll find an outline of probate and administration of estates, the process by which a Will is probated, any outstanding debts of the deceased person are paid and property is passed to their heirs. For those without legal expertise, a New York probate attorney can assist individuals named as executors in managing this process. The process of probate begins when the individual named in the Will as the Executor files the Will with the New York Surrogate’s Court, along with a certified copy of the death certificate, and a petition seeking letters testamentary. Letters testamentary grant the Executor the power to perform administrative functions on behalf of the estate. The proposed Executor will also need to file an affidavit from the two witnesses required by New York law to have been present when the Will was executed, stating that the deceased person (also known as the “testator”) was of sound mind when the Will was executed. The petition must also include the names and addresses of all heirs at law (known as “distributees”) as well as all beneficiaries listed in the Will. The distributees and beneficiaries must be served with notice of the filing of the petition and commencement of the probate proceeding. The Petition must also include an estimate of the value of the decedent’s assets passing under the Will. If everything is in order, the Will is then admitted to Probate, the Executor is appointed and Letters Testamentary are issued by the Surrogate’s Court. After the Executor receives Letters Testamentary from the Surrogate’s Court, the Executor will then begin to create a detailed list of assets owned, as well as debts owed, by the decedent. At this time, the Executor will notify any financial institutions of the death and that the Executor will be handling the administration of the estate. All property will need to be appraised, so that the Executor will know the total value of the estate. Before any assets can be distributed to the beneficiaries named in the Will, the Executor will need to determine whether an estate tax return needs to be filed. Estate tax returns are due nine months after the date of death. There may also be one or more personal income tax returns that need to be filed in addition to estate income tax returns that may need to be filed covering the period the estate is open. Additionally, any outstanding debts to creditors will need to be paid. This may require the sale of property contained in the estate. The final steps in probate administration will involve filing a final accounting with the Surrogate’s Court, and distribution of any remaining assets to the named beneficiaries. An experienced probate attorney can assist with the process of probating the Will, valuing the assets within the estate, preparing necessary tax returns, creating an accounting, selling assets contained in the estate, and settling any challenges to the Will before the Surrogate’s Court. 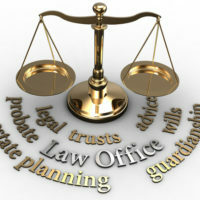 For assistance with probate matters before the New York Surrogate’s Court, challenges to a Will, or Will or Trust administration, contact the experienced and detail-oriented Hudson Valley probate administration attorneys at Rusk, Wadlin, Heppner & Martuscello, LLP for assistance at 845-236-4411 (Marlboro), or 845-331-4100 (Kingston).